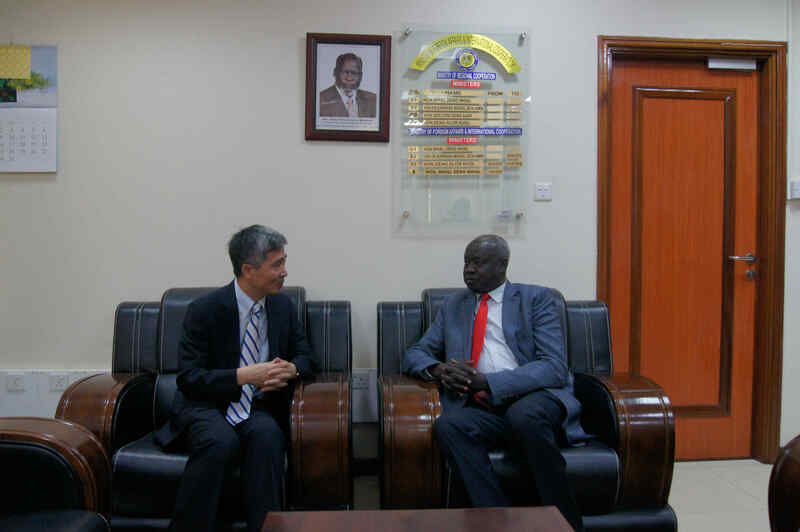 On March 8, 2019, Chinese Ambassador to South Sudan H.E. He Xiangdong bids farewell to H.E. Nhial Deng Nhial, Minister of Foreign Affairs and International Cooperation of the Republic of South Sudan. Ambassador Dominic Panther Mading, Director General of Department of China Affairs in Ministry of Foreign Affairs of South Sudan, was also present at the meeting. Foreign Minister Nhial spoke highly of Ambassador He’s outstanding contribution in promoting bilateral relations between South Sudan and China. Minister Nhial said Ambassador’s tenure coincided with the hardest time of South Sudan. Thanks to the efforts by the Ambassador, China is playing a constructive role in the peace and development process of South Sudan and offers valuable support to South Sudanese government and people. Deepening bilateral relations with China is one of the common aspirations of the South Sudanese government and people. South Sudan is willing to strengthen coordination and cooperation with China in various fields to further promote bilateral relations to new levels. Ambassador He appreciated the unremitting efforts of Foreign Minister Nhial to promote China-South Sudan relations and thanked Minister Nhial and his ministry for the support to him during his tenure in South Sudan. Ambassador He said that China attaches great importance to developing China-South Sudan relations and will work closely with South Sudan to further strengthen bilateral relations. Jointly with the international community, China will keep on supporting South Sudan peace process to realize peace, stability and development in South Sudan at an early date.